Here’s a peek at one of my first days on the “I Quit Sugar” pre-Christmas Program. As I’ve mentioned before, this challenge is whatever you make it– whether that’s cutting out only processed and refined sugars, or taking it a step further and cutting out all sweets, including the natural ones. Some people actually find it easier to cut out ALL sweetness for a brief period of time, to re-set their taste buds, so that they can enjoy natural sweets in moderation again. To each his own! Personally, I’m looking to cut-back on my daily dessert habit. I’ve been known to eat something sweet after both lunch and dinner, sometimes merely out of habit! This is something I’d like to see change over the next couple of months. I also don’t want to rely on zero-calorie sweeteners (including stevia) to replace this particular habit; I’d rather my taste buds adjust to eating, and expecting, less sweetness overall. I am still including fresh fruit in my own personal challenge, as you’ll see below. Un-pictured: Lots of water, raw probiotics, and a cap full of raw aloe juice. Green smoothie, made with my new favorite protein powder. I’m usually not a fan of protein powders, but when I heard that Sun Warrior created a raw plant protein, made from cranberry, pea and hemp protein, rather than from brown rice, I was excited to give it a shot. And I’m pleasantly surprised! I usually feel like hemp protein is too “grainy,” and brown rice protein is too “starchy,” but this one is “just right.” I chose the natural variety, which is free of any flavorings or sweeteners, so it blends into smoothies and drinks seamlessly. This particular green smoothie contained a frozen banana, a scoop of Raw Plant Protein, spirulina, almond butter, cinnamon, water and ice. Delicious! Plus, it didn’t leave me feeling heavy or weighed down, like other protein powders have in the past. Un-pictured: 2 capsules of Fermented cod liver/butter oil. Followed by half a bunch of kale, sauteed in grass-fed butter, and scrambled with 3 pastured eggs. Topped with raw goat cheddar. This is the time of the day when I’d usually crave something sweet. Since I was still full from my lunch, I opted for a warm mug of Slippery Elm tea instead! To prepare, mix 1 teaspoon of the maple-scented powder with 1 cup of boiling water, and stir to combine. Mixed green & arugula salad, topped with steamed artichoke hearts, cherry tomatoes and steamed beets, plus more homemade Dijon dressing. 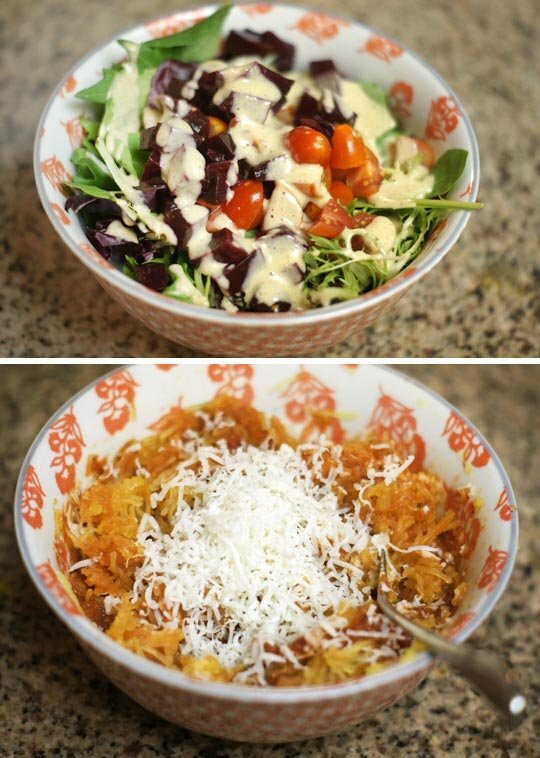 Followed by half of a spaghetti squash, smothered in marinara sauce and 3 oz. of raw goat cheddar. 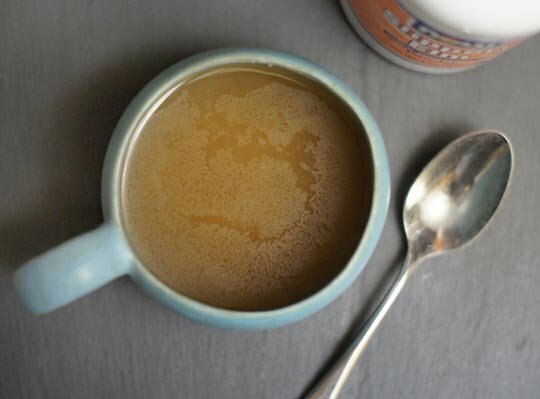 Post-dinner, I enjoyed a warm cup of homemade almond milk, with a spoonful of coconut oil and cinnamon added in. Very comforting! I think it has been about 5 days sugar free for me and it is amazing the difference I feel. My mood is much brighter, all the bloating around my mid-section is gone and I can see all my tummy muscles again, and I don’t have any cravings. I don’t miss the daily dark chocolate at all, which was the only refined sugar I was having. Thank you for the encouragement and inspiration. I am going to try and make sugar free my lifestyle after such amazing success. I had a funky breakfast scramble this morning, 1 very ripe banana, 2 eggs, 1/4 cup pumpkin puree, some vanilla, pumpkin pie spice, cinnamon, and a half scoop of protein powder. I usually make pancakes out of this but instead i scrambled it all up and made some type of mushy porridge! Once you got over the “ground turkey” texture it was pretty darn good! I take Dr. Ohira’s probiotics.. wondering why you seem to switch between Dr. Ohira brand and Garden of Life. Which do you prefer? I’ve never tried garden of life so wondering if i should make a switch. Let me know your thoughts! Hi Jennifer! I think it’s nice to switch things up, so that our bodies don’t grow accustomed to the same supplements over and over again. I think both probiotics are a great quality, which is why I alternate using them. I just ordered the new Sun Warrior protein. I found their rice protein unpalatable so am thrilled they have improved their formula, thank you for the tip. 2012 has been a year for me of eating 1 bar of dark chocolate most days and putting stevia on everything. I am joining you in re-adjusting my taste buds and taking on the sugar free challenge. For my challenge, I am going to do no stevia or refined sugar, keeping in a piece of two of fruit if I desire it. Dark chocolate hasn’t even been tasting good lately, but it is simply a habit to have it every night. Thank you for the inspiration Megan! 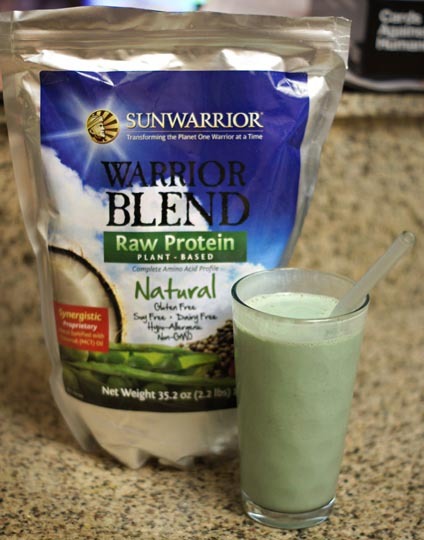 I’ve heard about the SunWarrior raw protein, but haven’t tried it yet. I love how it has minimal ingredients though! Have you ever tried the Garden of Life Raw Protein? It has 17g of raw protein. They also make a Raw Meal that has 34g of raw protein. They are both a little grainy, but I’ve gotten used to it and it doesn’t really bother me anymore. Thanks for the suggestions! I’ll have to check those out. 🙂 Sun Warrior also has 17g raw protein per scoop, so if you’re looking for a less-grainy alternative, you might want to try it! Hi Megan! I just love reading what you eat – it always sounds delicious. I have a question about your spaghetti squash “pasta”. Mine always seems to turn out so watery and when I mix it with sauce it’s like a big bowl of slop. In your pictures, it doesn’t look watery at all! What is your secret? How do you prepare it? Thanks!! Re: sugar and things that turn to sugar in the body. I, personally, try to stay away from all forms of sweetening – even overly sweet apples or other fruits. It seems to trigger sugar cravings. Like someone else mentioned, even dark chocolate seems to turn on the sugar thoughts. I was diagnosed as pre-diabetic (for many years – in part due to HP & chol. meds, I’m gluten intolerant, somewhat over weight and determined to change my health (even though I thought I was eating properly) so I was not pre-diabetic any longer. Cutting as much sugar or converted sugar from my diet (even reducing my much beloved fruit habit) was responsible for the good glucose #’s. Nine months ago, I started eating Paleo, lost 25 lbs over the course of 6 months and at the last physical, my doctor declared that I was no longer pre-diabetic! I am elated. But, my cholesterol #’s were up (& I still need to drop 30 lbs) – because I was eating more meats and cheeses – so now I’m determined to get those #’s down as I have been turned down by health insurance companies for only being at 267 on the cholesterol scale. More fish, almond milk cheeses replace dairy cheeses, coconut milk and finding a good protein powder to make some of your smoothies seems like a good start. 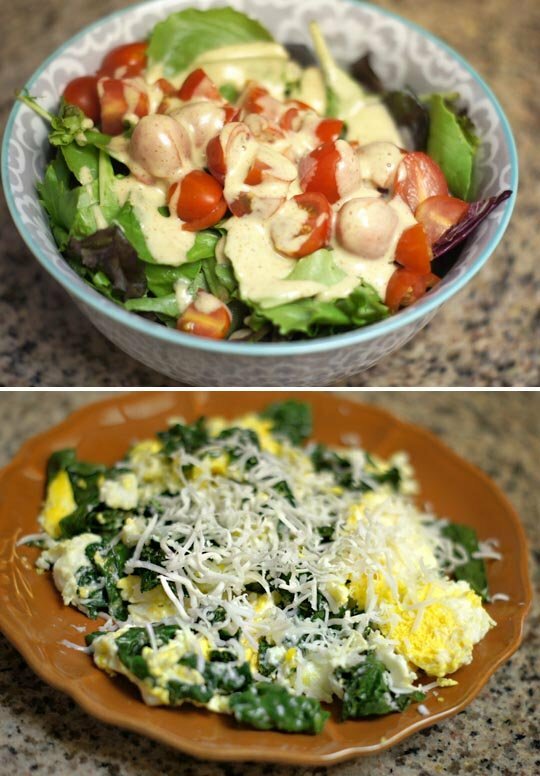 I love your blog Megan, as it shows how a person can eat very healthy with variety and satisfying taste. I’m discovering “new favorites” every day. Hi Megan! Your day looks delicious as always but I wanted to ask you do you order aloe juice online or should I be able to find it at trader joes or whole foods and what is a reasonable price I should expect to pay? Also does it need to say raw or anything like that? That’s the ONLY brand of raw aloe juice I recommend. Other brands add sugar and other preservatives, and overall feel less effective. I’ve seen it available at certain Whole Foods, but it’s not always in stock, so Amazon seems to be the best option. Hope that helps! Getting rid of sugar or even lowering your sugar in your diet is such a challenge. Especially if you are used to it all the time. I used to want something sweet right after lunch and dinner. I usually satisfied it with a piece of dark chocolate. Now I rarely eat sugar. It was hard the first couple weeks but now I don’t even care to eat anything sweet. This is a weird question but do you burp up that fermented cod liver/butter oil blend? I wanted to order some but have burping issues with fish oil capsules. I’ve never had that issue myself, but I’ve heard it’s very common with fish oil capsules, in general! I love that you’re going stevia-free. I’ve recently cut it out as well, mainly to see how I feel, but also because of how processed it appears to be, and that its been known to cause other issues. I’ve tried the Sunwarrior protein powder, and that one is probably my favorite, based on tolerability. I’ve recently been trying to formulate a recipe using slippery elm as a thickener, so it’s interesting to come across someone who drinks it for flavor! 🙂 Love this post, as always. Curious to know why you don’t like brown rice powders. I use vega myself. I’ve just never cared for the texture or taste of brown rice powders– it always tasted like I added a big scoop of flour to my smoothies! Thanks for sharing this! I’m also trying to stay away from sugar and your blog has given me lots of great tips! i don’t like the taste of vega, but like jay robb vanilla egg white. i have tried sunwarrior classic vanilla and it was ok. does this blend have any ‘gums’ in it to thicken? Nope, no gums! Looking at the back of my bag, the ingredients are just Pea Protein, Cranberry Protein, Hemp Protein, and medium chain triglycerides. Delicious eats! I just came back from the SM farmer’s market with some squash & fresh herbs- I want to try out your squash pasta recipe with some fresh thyme, oregano & oven roasted tomatoes thrown in. I’ve been starting my day with jasmine green tea & almond milk, then later when I’m hungry I’ll have a diced pear or apple (berries if available) sprinkled with some raw trail mix (pepitas, dried mulberries, other seeds) in almond milk (it’s my version of cereal and milk :). I am ready to start juicing again. What is your fav combo for breakfast? I work out first thing in the morning so I need it to be delicious, nutritious, and filling. My favorite combo is a cucumber, romaine heart, 4-5 kale stems, 3 large carrots, a whole lemon, and about an inch or so of fresh ginger. If you like your juice a little sweeter, you could always add an apple or pear, too! Thanks! I will try that then! I had the juice this morning at about 730 am. I followed at 930 with a banana and coffee. It’s 1030 and my tummy is growling. How do you avoid hunger like this?! :). I’m trying to hold out until at least 1130 for lunch. It’s so funny how after we don’t eat sugar for a long time (notice I say sugar not sweets!) how the tastes change. I had some kit kats and butter fingers the other night from our halloween candy and they were not satisfying at all! I actually had a big bowl of puffed milled with vanilla almond milk, walnuts and bananas after that and was totally satisfied….my husband called me a hippie and I don’t care! I’ve got to try that! Last night I made the bf and I your pumpkin sage pasta (using “real” pasta for his, spaghetti squash for mine) and it turned out so delicious! That’s 2 of your recipes in 1 week that have served me well! Thanks! Ditto what Amanda said (made the pumpkin sage sauce and served on real pasta for hubby and spaghetti squash for me). VERY tasty sauce, Megan! Although, I found it a bit salty (to compensate for the sweet spaghetti squash, no doubt), so I actually turned the left over sauce into a “pumpkin bisque” by adding more milk (I used “So Delicious” coconut milk) and it was FANTASTIC as a soup! I also love SunWarrior, but I prefer the chocolate blend! I mix it with almond milk, mejool dates, vanilla, spirulina, spinach, cocoa, and a hint of peppermint extract – a chocolate peppermint smoothie! Have you tried the Vega raw protein powders? I’m a huge fan – my favorite flavours are the Acai Berry and French Vanilla. Totally delicious and gives a little extra “something” to a green smoothie. Oooh, that chocolate peppermint smoothie sounds delicious! I might have to try a version of that with the natural stuff that I’ve got– I’ll just have to add extra cocoa! I have tried Vega before, but I don’t care for their any of their flavors. I was especially disappointed that their “natural” flavor is still sweetened with stevia. I prefer to control that myself, so I’ll wait until they release an unsweetened version. The new Vega One line tastes better than the original WFHO but is still stevia sweetened and contains inulin. It doesn’t agree with my stomach very well. I recently found the Sun Warrior line of protein as well and really like it. Their protein doesn’t bloat me up like Vega does and I like that they don’t have added vitamins. I had the same lunch as you yesterday and it was perfect! I was inspired by you when I made it!